Kalduny or kolduny (Belarusian: калдуны, Russian: кoлдуны, Polish: kołduny, Lithuanian: koldūnai, used in plural only) are stuffed dumplings made of unleavened dough in Belarusian, Lithuanian, and Polish cuisines, akin to the Russian pelmeni and the Ukrainian vareniki. Kalduny, dumplings of unleavened dough filled with meat, mushrooms, or other stuffings, are related to similar dishes in the West and in the East alike, from Italian ravioli and Russian pelmeni to Central Asian manti. The origin of kalduny is uncertain: they may have originated with equal likelihood in the West (Germany or Czech lands) or in the East (brought by the Tatar-Mongols across Siberia and the Urals). Kalduny made with a stuffing of smoked ham and mushrooms (Kalduny Count Tyshkevich, named after a Belarusian noble family) were long considered Belarus’s “visiting card”, although decades of Soviet rule almost erased their trace from public memory and now they are only served in a few local restaurants. The simplest dough for kalduny is made of flour mixed with tepid water, eggs, and some salt. In some recipes the dough for kalduny is mixed with onion juice, not water. Kalduny dough should be soft but elastic, easy to stretch and to seal into a pocket around a dollop of filling. Like other pastry doughs it has to be allowed to rest, covered with a dish towel or a cloth so as not to dry out. 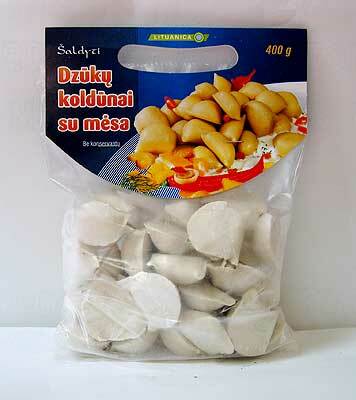 Left: Ready-made kalduny produced in Lithuania. Kalduny are usually boiled in a big shallow casserole at low heat, in well-salted water. Instead of boiling in water, kalduny may be boiled directly in a soup, in which they are then served. Some varieties are baked or fried. Kalduny Polesie style, with a stuffing of boiled river fish and hard-boiled eggs, are fried. Kalduny may be served as a main course or a dessert, depending on the stuffing. For the former, meat, mushrooms, farmer cheese, or fish is used; for the latter, fresh berries or sometimes dried fruits may be used. The sauce or topping for kalduny also depends on the stuffing. Kalduny with Vilnius stuffing (mushrooms and smoked pork, as in Kalduny Count Tyshkevich) are topped with melted butter, while the Russian stuffing (farmer cheese or mashed potatoes) requires thick sour cream. Dessert kalduny are powdered with cinnamon or topped with fruit syrups. 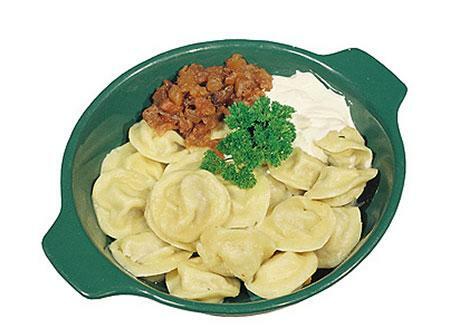 Kalduny are often served in a soup (beef broth or borsht), similarly to Jewish kreplach. The numerous combinations of dough, stuffing, and sauce provide a great potential for variation. Large kalduny (manti) are prepared for the major Muslim feasts, which are celebrated by the Tatar population that has lived continuously in Belarus since the end of the 14th century. This variety of kalduny are made with spiced mutton or veal stuffing and are eaten by spoon, so that the dough wrapping doesn't tear and the juice from inside is not lost.